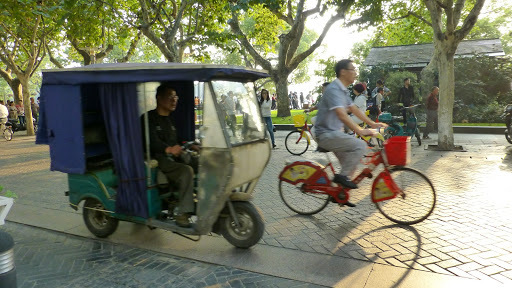 Loving, loving, loving China. 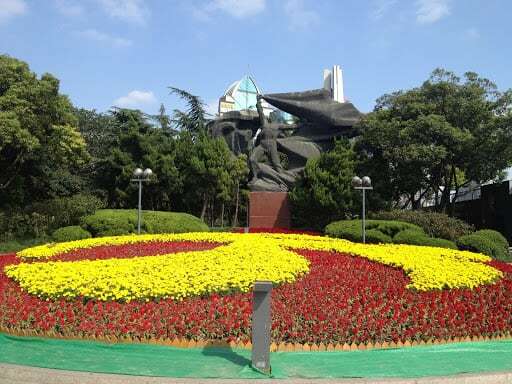 Did I mention how much we love China? We’ve been treated to amazingly fantastic food (oh, the food the food), incredible scenery, beautiful friendly people, mega cities and amazingly fantastic food. Without wishing to sound like a broken record, this trip has exceeded our expectations at every level. 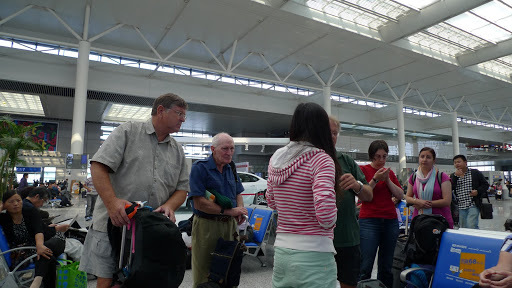 We were not ready to leave Shanghai just yet and I have to admit that I wondered why we were going to Hangzhou when there was so much in Shanghai that we missed out on. I thought it would have to be a pretty terrific place for us to leave this amazing city so soon. The very large train station in Shanghai. We were very good at paying attention to Jing, otherwise we’d be left behind. Sometimes instructions had to be repeated. 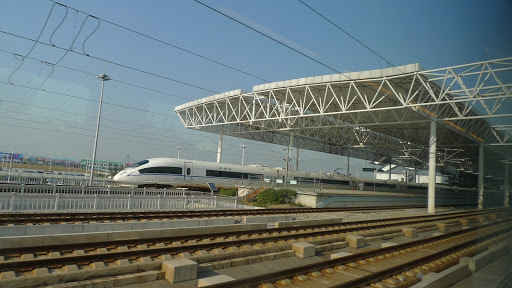 As we made our way from Shanghai to Hangzhou on another bullet train, Jing told us that Hangzhou is considered the most beautiful city in China. 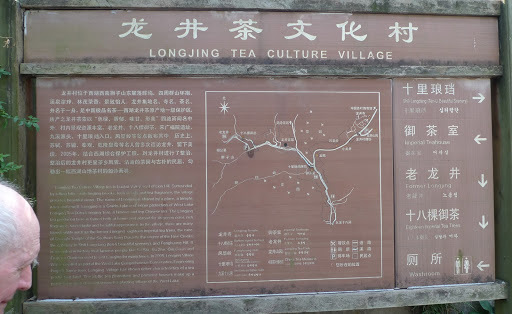 Our first stop was the Longjing tea village, and we were told that Longjing tea is the best green tea in the world. Well we’re about to judge that for ourselves. 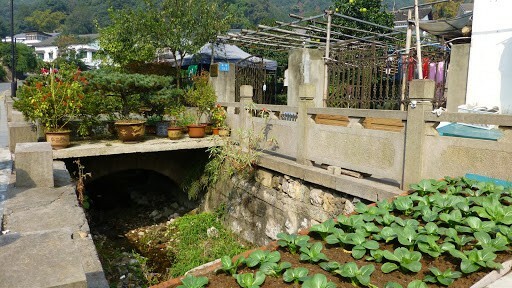 The legend goes that a dragon once lived in a well in the village. The locals believed that the dragon was the symbol of luck, and the dragon had the responsibility to control the rainfall. And so they referred to the place as Dragon Well. A plant that grew near the Dragon Well was known to be curative. 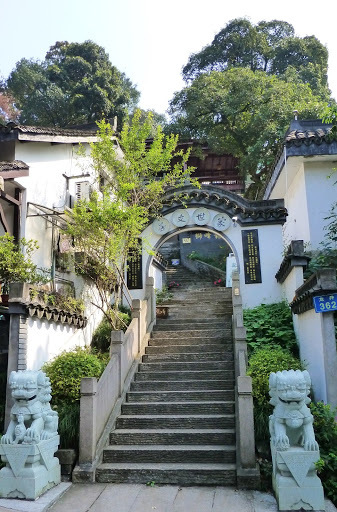 Qing dynasty emperor Qianlong was visiting the Dragon Well village one day when he heard that his mother was ill, so he took some of the plants home to her. 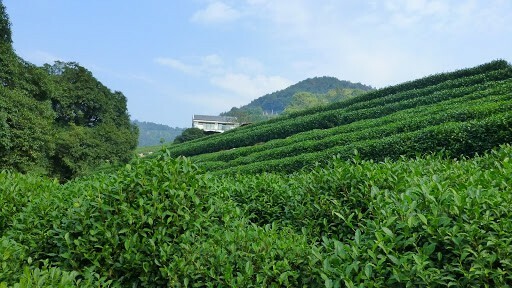 It is said that the plants cured his sick mother and from then on, the plant became known as a tea tree, and that variety of tea tree was called Dragon Well Tea – Longjing Tea in Chinese. 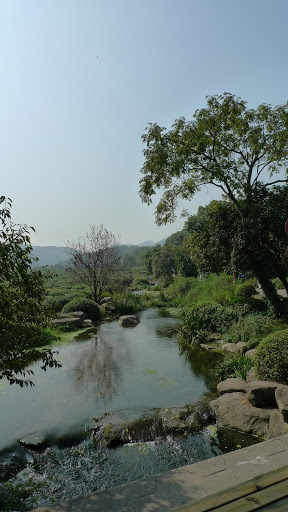 The Longjing tea-growing area is certainly very lovely. 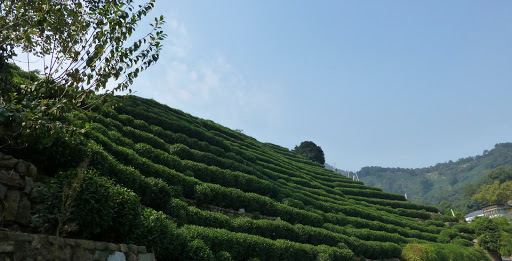 Luscious green terraces covered the hills, the tea trees perfectly manicured ready for the next growing season. 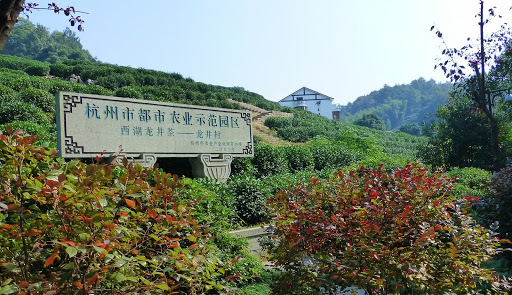 That sign says something about the Longjing Tea Gardens being the best in China. 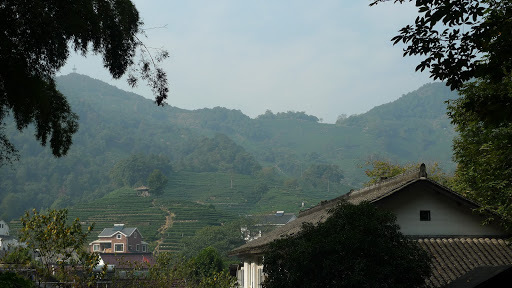 The Longjing tea village was very pretty. 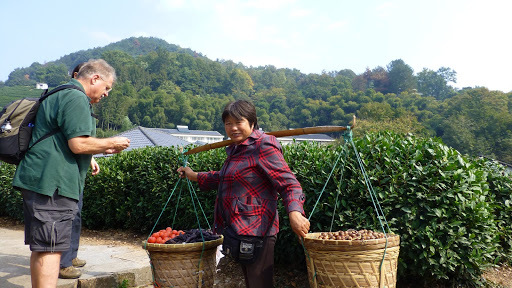 We asked the gardeners (via Jing) what they were growing here and they said “vegetables”. When was asked what kind of vegetables, they said “green”. 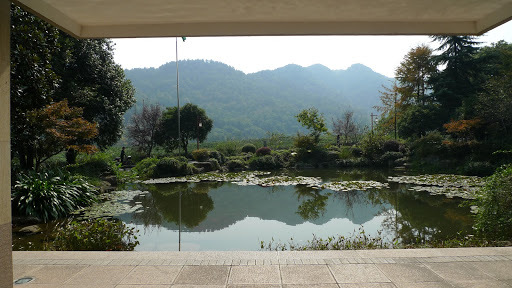 We had the opportunity to visit the China National Tea Museum which was surprisingly fascinating, and we really enjoyed the tea ceremony. 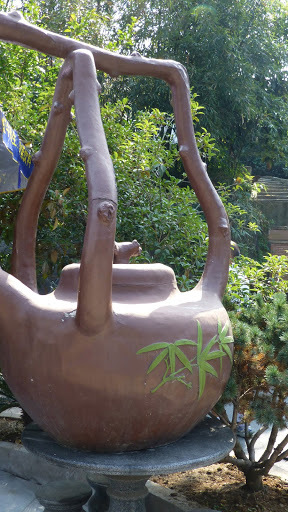 A bit of garden art. 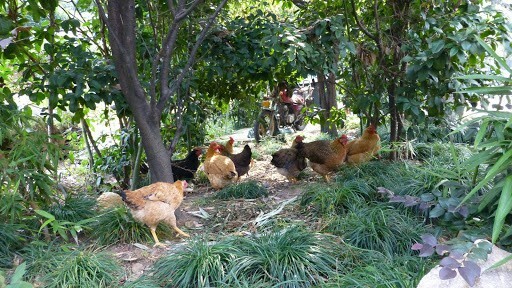 Chinese chooks. Do they look any different to Aussie chooks? I don’t think so. George taste-testing locally grown persimmons. 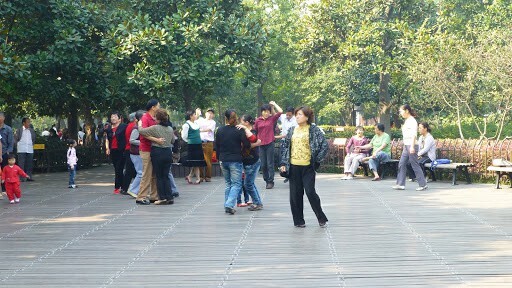 Here again in Hangzhou we were treated to public singing and dancing. 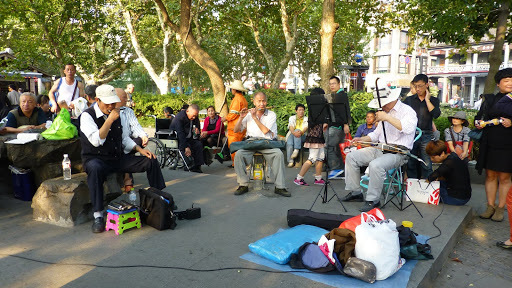 The Chinese people just love the outdoors and to entertain themselves as much as others. No busking here, just pure enjoyment. These people invited me to join in and I declined. Now I wish I hadn’t. 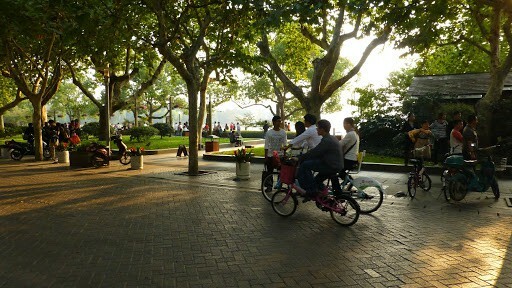 Hangzhou is a UNESCO world heritage site. 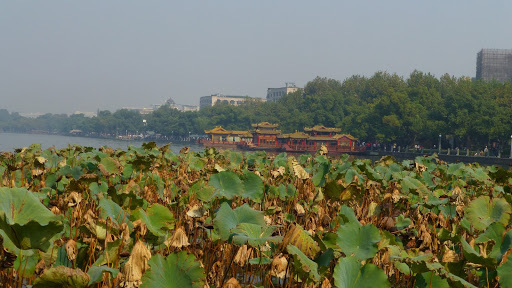 The city is famous for the very picturesque West Lake, with pagodas all around and many walking and cycling paths and incredible gardens. 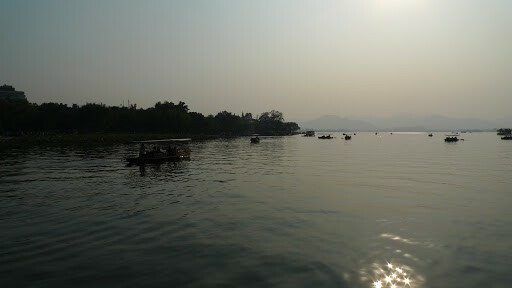 I’m really sorry I didn’t take more and/or better photos of the West Lake. The place was typically misty and not sure if the mist was smog but I don’t think so. These pics won’t show how pretty the lake really was. 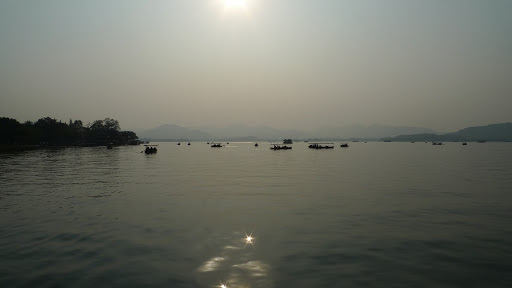 We found out that there is a water show every evening on the lake, and we saw hundreds of Chinese people lined up along the foreshore waiting for the water and light show to begin. They love it. The fountains are all choreographed to Chinese music and it’s really lovely. Wish I had thought to video it. Bugger. 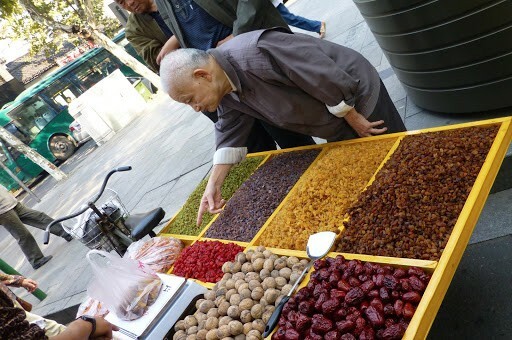 Chinese people say that Hangzhou is the best place to retire, and on the surface we reckon we could spend a long time there. 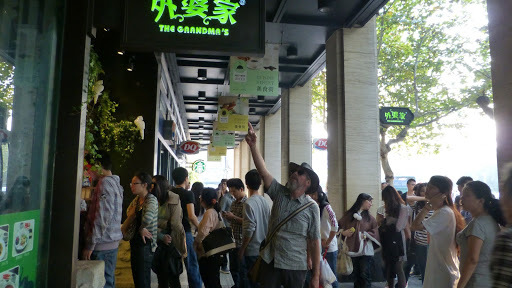 A favourite restaurant for us, The Grandmas. Its always difficult to get a table. Fantastic food. 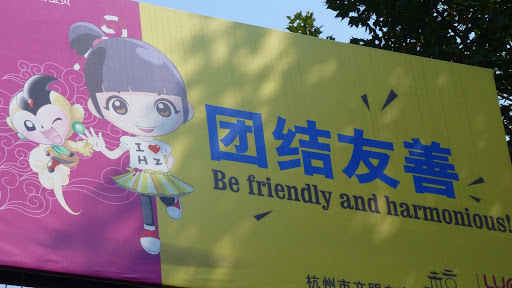 Good advice in any language. 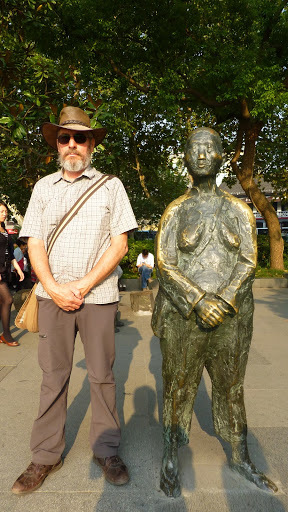 Well, I’m really glad we had our few days in Hangshou, despite the shorter stay in Shanghai. There’s always compromise when you’re trying to fit in a lot of fabulous places in a short time frame. 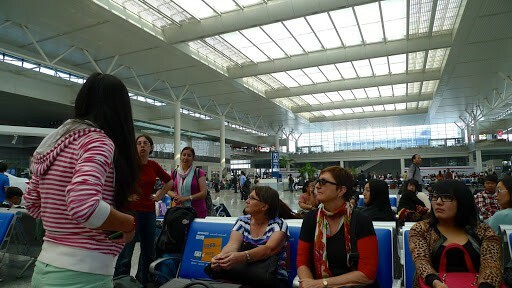 We’re starting to realise that the trip is on the home run and we only have Xian and Beijing left to visit on this awesome trip. So next time you drop in for a visit you’ll see us with the Terracotta Warriors. Now that’s worth coming back for. See you soon.